I selected, filled, shrink, filled, shrink and filled (BGR). I could try taking into account the math beforehand, but I'm wondering if there is a simple way to do this, either with Gimp or other software used in graphic design? A is also the area of the green and blue area, respectively. Therefore, the outer radius of the green ring belongs to a disc with area 2*A. So, R_green is sqrt(2) times bigger than R_red, and R_blue is sqrt(3) times bigger than R_red. Some one did ask a similar question on Mathematics SE -> How to divide a circle into 9 rings / 1 inner circle with the same area? You will have to adjust the equation a bit. in adobe illustrator : draw the circle in any size you want , then copy it. after that past in the same place and use the selection tool (v) to re-size it with keep clicking on alt with shift buttons. copy the new one and past it in the place and then click on Ctrl+D 2 times. Illustrator: how to colour segments of a circle with different colours? 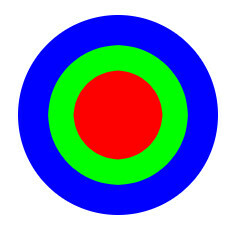 How do I split a circle into equal sections in Inkscape?